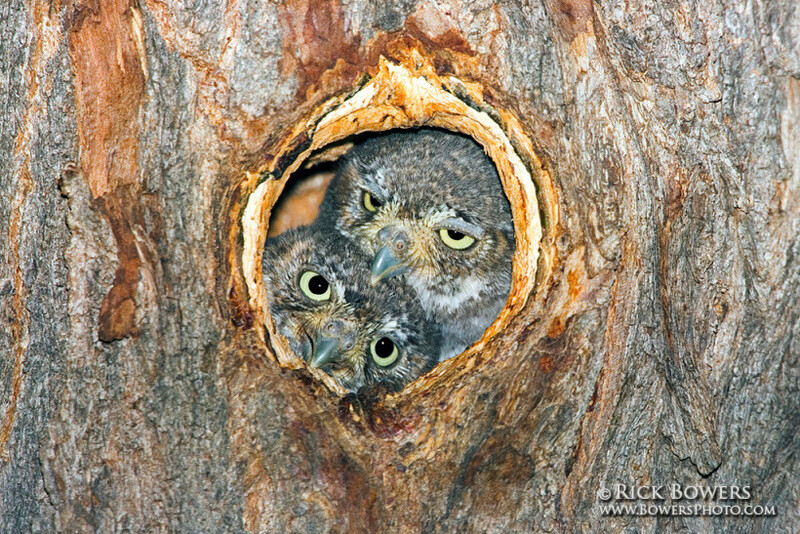 I've read that there are up to 200 species of owls, encompassing many sizes, shapes and colors. 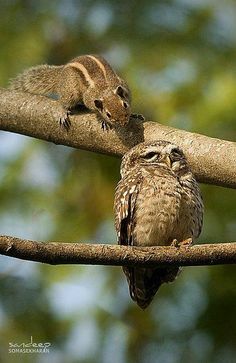 What's the smallest of all the owls? I'd like the name and some information about its characteristics, behavior, and habitat location. 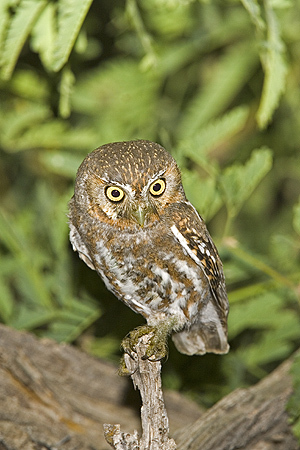 The smallest owl in the world is the elf owl (Micrathene whitneyi). It's about the size of a sparrow, and weighs about an ounce and a half, which is just less than the weight of a golf ball! Wingspan: 13 1/2 - 16 1/2 in. Length: 5 - 5 3/4 in. Tail: 1.8 - 2.1 in. Average Weight: 1 1/2 oz. 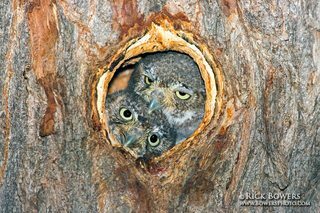 The elf owl has no way to make its own nest, so it lives in nests that have already been made, generally by woodpeckers. 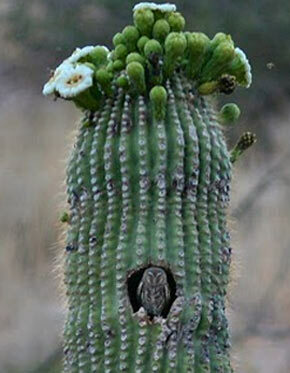 Nests are found most frequently in cacti, especially Saguaro, and in high trees in mountains. Nests at elevations of up to about 600-2200 meters (2,000-7,000 feet) are also common. They can be found in dense mesquite, dry oak woodlands, wooded canyons, sycamores, and probably any other tree within its elevation range. In the United States the range is mostly the extreme south of Nevada, across central Arizona, Southwest New Mexico and West Texas. 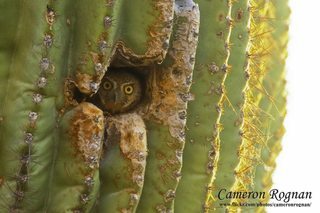 They migrate south for the winter, where they live and breed in Mexico, primarily the Baja region. In North America breeding season is normally May and June, in Mexico it's March through August. They may lay 1-5 eggs, but 3 are the most common. The incubation period is 21 - 24 days. The young can capture food as soon as they can fly (27-28 days of age) and fledge shortly thereafter (28 - 33 days of age). Their diet consists almost exclusively of arthropods, like moths, crickets, beetles, and spiders. Scorpions are an important staple, but they usually remove the stinger before eating. They may also stash scorpions away (a behavior called caching) so they can eat them later. They've also been observed eating lizards and small mice, even though by looking at them you wouldn't imagine how! Since water in the desert can be hard to come by, they've adapted to get all the water they need from the prey they feed upon. 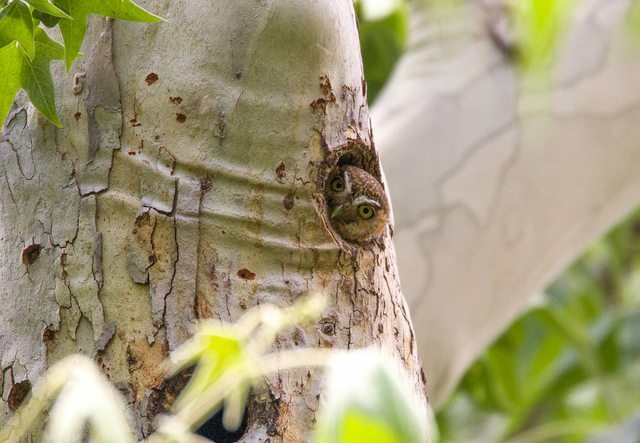 Although the elf owl has predators, it is generally hard to find, and would rather hide than fight. Like an opossum, it has the ability to "play dead" when threatened. It hunts only at night, when most of its predators aren't active. It uses a combination of sight and keen hearing to locate its food. Elf owls have "silent flight" which means they don't make any noise as they approach their prey. The sound of their wing beat is muffled by softened feathers on the leading edges of their wings. 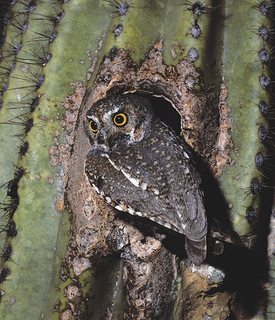 Sadly, there has been a drastic drop in Elf Owl populations in the United States, but that's due less to predators than to the changing habitat as desert areas have become developed for homes and agriculture. Now that you know where they live, you have some idea where and when to see one. If you live in their native range, you may have some elfs nearby and not realize it, because they sound more like birds than the owls we're used to hearing. Here's an example. Also, the organization Birdnote is taking a group to Big Bend National Park in Texas this coming August. 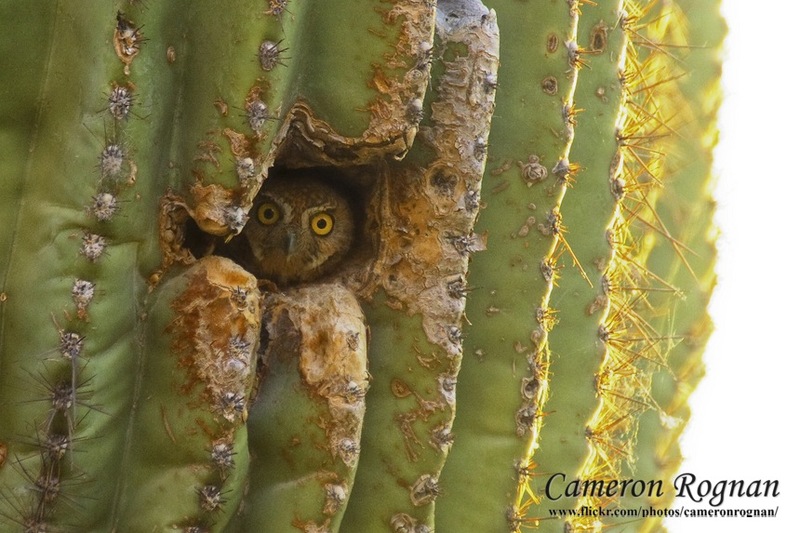 Elf owl sightings are expected, so if you can get there, it sounds like a great opportunity! Click on pictures for closer view. More photographs and sounds can be found at the references I've used in this answer, which are listed below. Not the answer you're looking for? Browse other questions tagged birds bird-behaviour bird-watching owls or ask your own question.